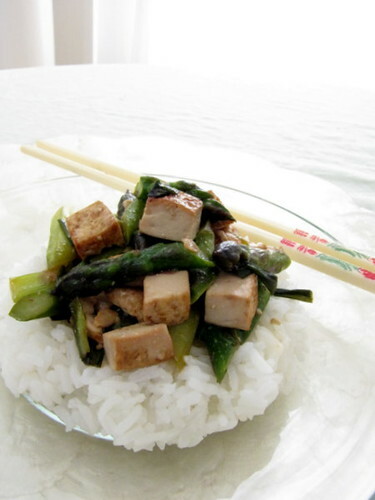 Food Friday: Asparagus Tofu Stir Fry ~ I Can Do That! In a wok or large non-stick skillet, heat 1 tablespoon oil and pan fry the tofu until golden brown. Add the remaining tablespoon of oil and add scallions. Stir fry for 1 minute then add the asparagus. Stir fry for 1 minute. Add soy sauce, sherry, and red pepper flakes. Stir cook for 2 minutes or until half of the liquid has evaporated and asparagus is cooked but still crunchy. Turn the heat off and sprinkle the sichuan peppercorns. Serve immediately over hot steamed rice. That looks great. I have trying to push my family to eat more tofu but my husband tends to resist until I set it in front of him. He would love this recipe.